...when you don't have a florist's van! If I'm taking a small bouquet to the hospital, I try to use a vase which will fit in my car's cup holder. These large garden bouquets were too big, though. I tossed and turned all night worrying how to transport them with the kids. Finally I came up with this cheap solution: a box within a box. Choose a small box that fits tightly around the container. A milk carton works well for many vases. Then, find a box that is wider and lower than the first. Cut the appropriate size opening in its center. 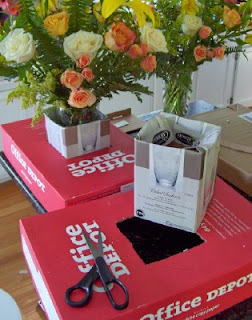 Place the wide box in the car, then insert the second box, followed by the flowers. It worked! Not a drop spilled or a stem out of place. Whew! Next time I'll leave the flowers to the experts! Thanks for all the impromptu advice yesterday! Flowers were sold out all over Nashville due to graduation ceremonies over the weekend. My husband was worried bugs might crawl out of my lemon trees, so I made a basic bouquet with what I could find. Harris-Teeter sells 3 flower bundles for $12. The bouquets look fantastic! And very clever solution to transporting them! 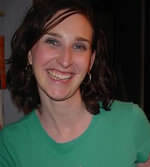 I glean so much useful advice from your blog. Wow! Meredith, that's a creative solution! And the flowers sure don't like like $12-worth of grocery store flowers! Do you have any advice for SENDING flowers inexpensively? For us, relatives live a long way away. Great job with both the flowers and there tranportation! Beautiful bouquets! I had to to do this one Mother's Day, when I decided to buy a huge thing of roses from Sam's Club for the two moms. I rested the two vases each inside of a plastic ice bucket. I then surrounded them with towels, to keep them upright and absorb any spilled water. Then I set them inside of a box. 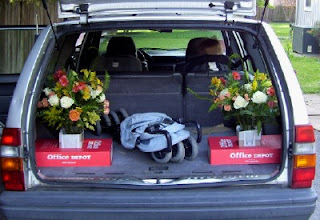 Who would have thought that transporting flowers takes so much coordination!